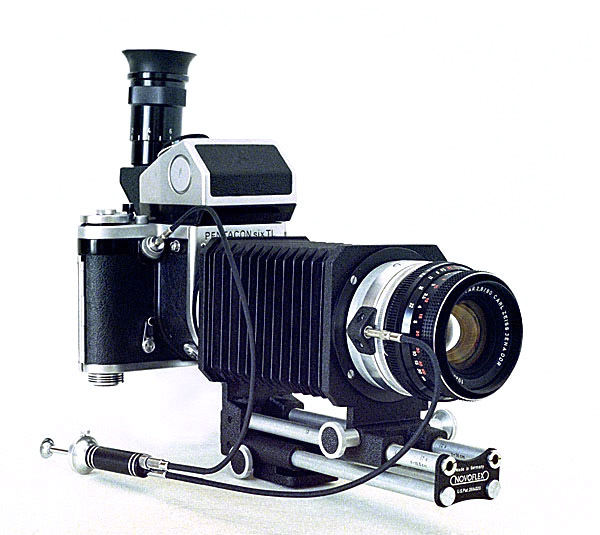 The highly-regarded firm of Novoflex, located in what was at the time West Germany, made its bellows available with the Pentacon Six mount. This smart unit has an integrated focussing slide. 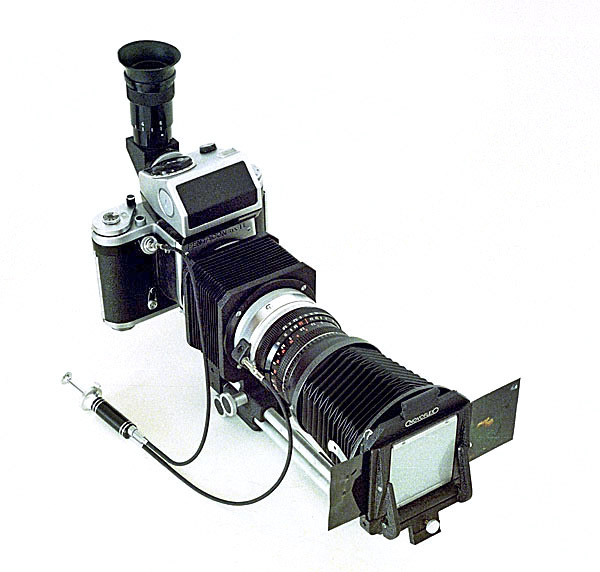 The lens mount at the front and the camera mount at the back can be exchanged for other mounts, facilitating the use of Pentacon Six lenses on other cameras and lenses with other mounts on the Pentacon Six – naturally for macro work only, especially if one is using lenses designed for 35mm-format cameras. The Novoflex bellows on the Pentacon Six, using the 80mm Biometar lens, metering prism and angle finder, which with its dioptre correction and extra magnification facilitates accurate focussing, which is always particularly difficult to achieve in macro work with any camera and lens. The bellows unit made by Pentacon has a lever – seen at 8 o’clock in the top photograph – that presses on the lens aperture pin, to maintain the aperture at maximum, which is really essential for focussing on moving objects in macro work – especially as a very small aperture is usually desirable to increase depth of field as far as possible. As explained on the Pentacon bellows page, here, a double cable release automatically stops down the lens just before the shutter fires. 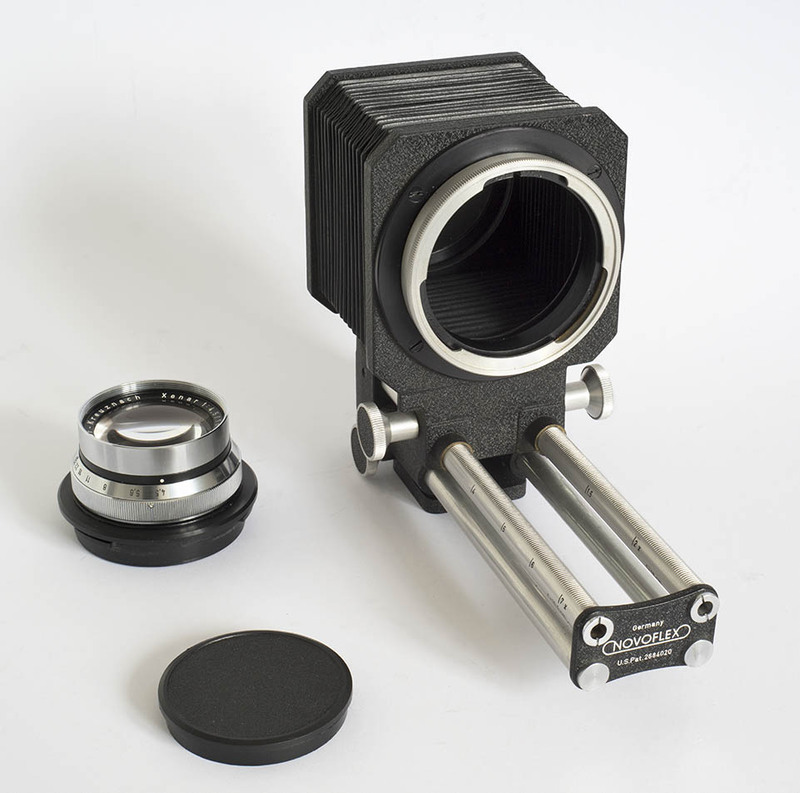 There is no such aperture pin lever with the Novoflex bellows, making the use of the Pentacon aperture control ring (also illustrated on the Pentacon bellows page) highly desirable. Naturally, this increases the minimum extension of the bellows. Here is the same outfit, with the aperture control ring and double cable release added. The double cable release that came with the Novoflex bellows is also of West German design. It works well, but has a long rigid end section that screws into the aperture control tube. This section fouls the aperture ring on the 80mm Biometar, making installing the cable release and changing the aperture difficult. Using the original, East German, double cable release avoids these problems. Of course, older lenses without aperture automation from other manufacturers can be used (via a suitable mount) on these bellows. In that case, no double cable release is required – but users must remember to stop down the lens manually before firing the shutter! One of the great plusses of the Novoflex bellows is the slide copying attachment that Novoflex made for it. 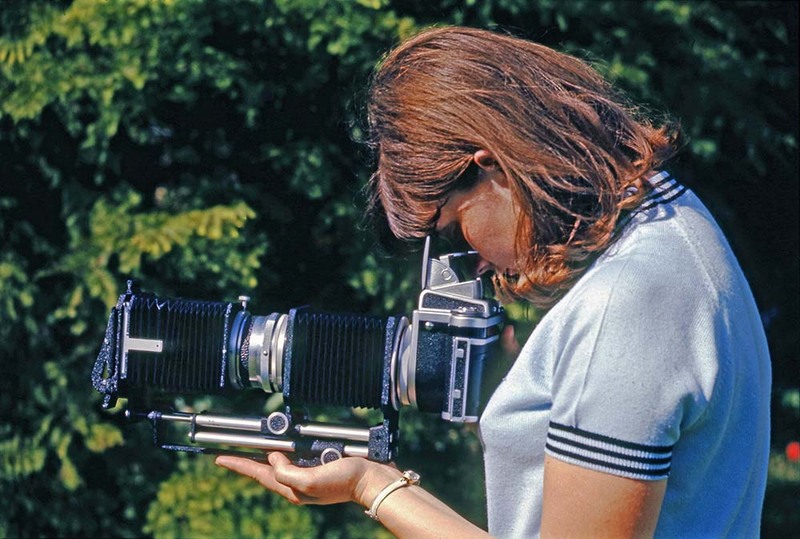 This magnificent accessory makes the copying of Medium Format (or smaller) slides easy. An impressive set-up capable of producing professional results of the highest quality. ensuring that no light can enter and degrade the image. The observant among you may have noticed the name “Hasselblad” on the slide copier. This outfit, here supplied with the Pentacon Six mount, was at the time of manufacture the best in existence for Medium Format macro work and slide copying. Novoflex bellows for the Pentacon Six are hard to find and usually fetch a very high price. 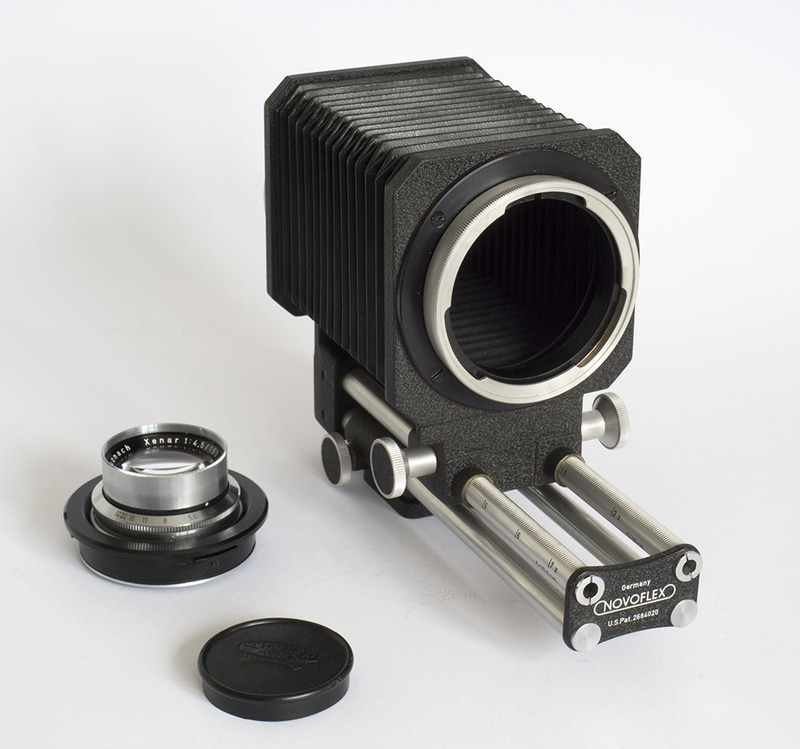 Over many years Novoflex has made macro bellows, but of course one with the Pentacon Six mount is not part of their current range. 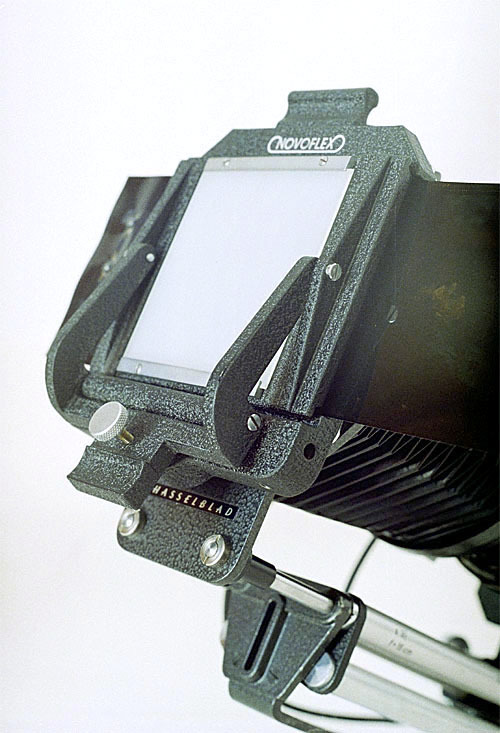 We note that in this photograph the supplementary bellows (or BIGSON lens hood) for the copier have a square section, as opposed to the octagonal-section bellows that can be seen above. 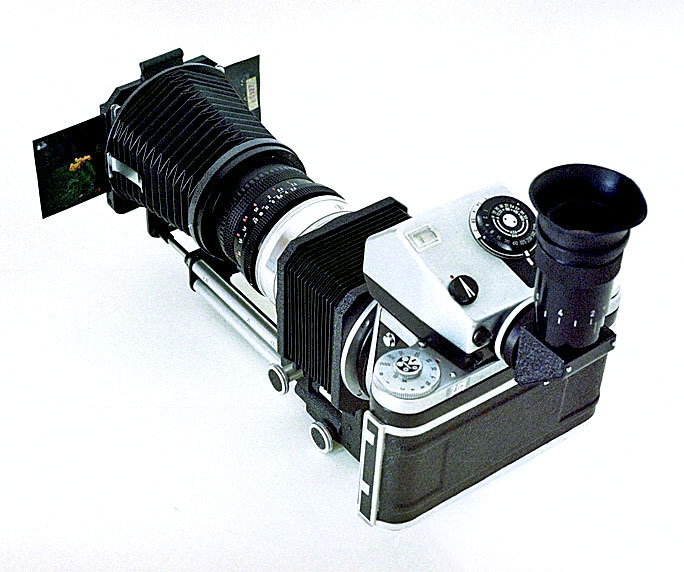 Other publicity photographs taken at the same time show the bellows with the Schneider Kreuznach Xenar 180mm and the Xenar 150mm. It all looks very easy, but I personally would not hand-hold the copying set-up (even though movement should not cause problems such as blurring or lack of sharpness, as everything would move together). I would also prefer a background that had a neutral colour, such as a brightly-illuminated white wall (which, like the background here, would be completely out of focus to the camera lens). Nevertheless, the photograph is very informative and very attractive. It will no doubt have attracted the attention of photographers in the 1950s and 60s. 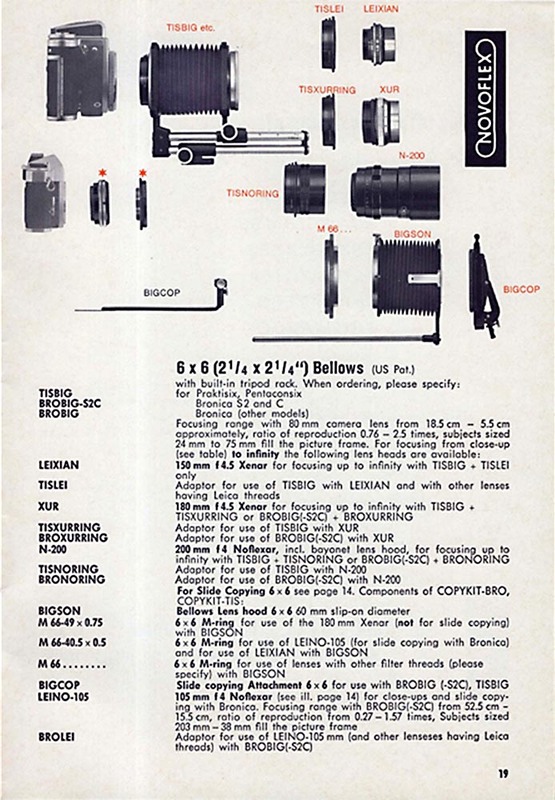 The page reproduced on the right here from the Novoflex catalogue of the time lists the two Schneider Xenar lenses and the adapter rings needed in order to mount them onto the Praktisix/Pentacon Six version of the Novoflex bellows. It was still the custom to give components a code made up of letters that (supposedly) made clear what the component was for. In this case, the 150mm Xenar has the code “LEIXIAN” and the adapter ring to mount this lens onto the Novoflex bellows for the Praktisix/Pentacon Six (“TISBIG”) has the code “TISLEI”. The codes for the 180mm Xenar and its adapter ring are also given. We don’t just think that this outfit should produce superb results; we know that it does, having used this very lens on these bellows, for some of our flower macro pictures, some of which can be seen here. Here we have partially disassembled the components: The Novoflex bellows for the Praktisix/Pentacon Six (“TISBIG”) are on the right. In the foreground is the Joseph Schneider, Kreuznach lens cap, and behind it the 150mm Xenar on the adapter ring (the “TISLEI”). The next two images enable us to see the 150mm Xenar and the TISLEI adapter ring more clearly. Here we see the front of the 150mm Xenar lens and the front of the adapter ring into which it screws. 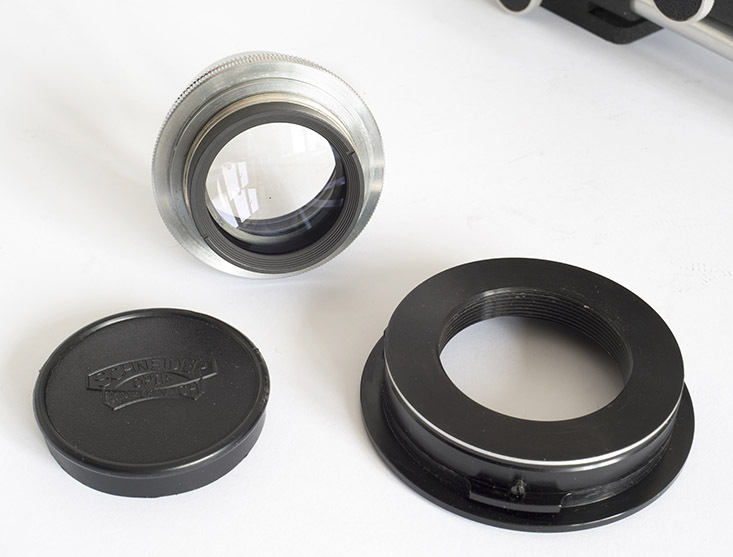 The TISLEI is able to recess the back of the lens below (or behind) the front of the adapter ring, in order to ensure infinity focus when the lens is on the Novoflex bellows. And here we see the back of the 150mm Xenar lens and the back of the adapter ring into which it screws. In this picture it is easier to see that the back of the TISLEI ring has a standard Praktisix/Pentacon Six lens bayonet. Finally, here are two more pictures of the Novoflex bellows. This view clearly shows the back of the bellows, with the Praktisix / Pentacon Six bayonet. This is held in place by a ring with four screws. It would clearly be easy to swap this for a different mount, if one had the required mount. The above page from the Novoflex catalogue lists some of the mounts and the codes for them. The 150mm Xenar is mounted on the far end of the bellows in this image. And here we see the underside of the bellows unit. The focussing slide has threads for both ¼" and 3/8" tripod screws. In the above page from the Novoflex catalogue, what I have called the “focussing slide” is called a “built-in tripod rack”. Both terms explain what it does: in macro photography it is often necessary to move forwards or backwards by tiny amounts, either to get the framing or the focussing right. Without a focussing slide, one would have to lift up the tripod legs, totally disturbing composition, focus and possibly the subject, if it contains animals or insects. 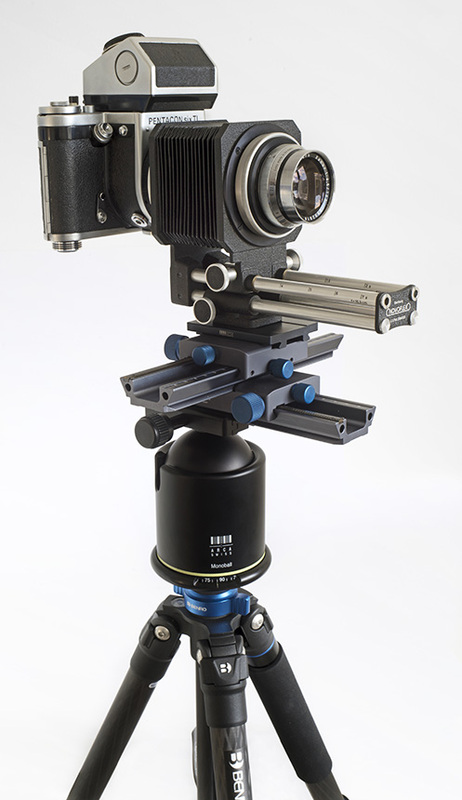 When setting up, the focussing slide should be positioned near the mid point of the bellows rack. The whole assembly can then be easily and quietly adjusted backwards and forwards, by fractions of a millimetre, if necessary. These bellows (“TISBIG”) are designed to be used as illustrated here, with the focussing rail at the bottom of the assembly – or they can be mounted vertically on the upright column of a copying stand. 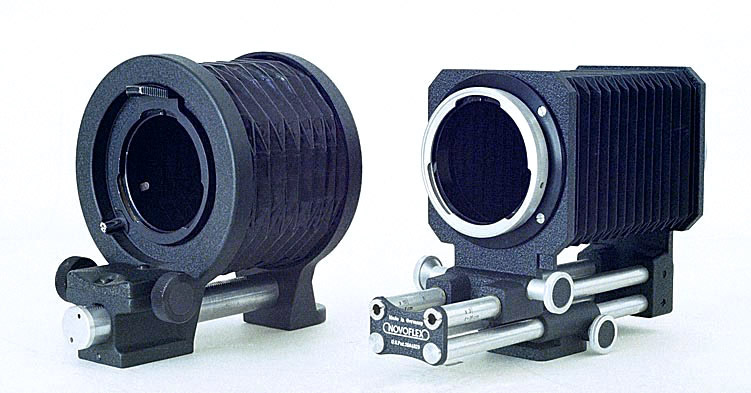 They are not to be confused with the elusive bellows for the 500mm Noflexar lens, which have the code name “TISBIG–U”. The TISBIG–U is designed to be mounted “upside down”, with the focussing rail at the top of the assembly. The image scales engraved on the focussing rail are therefore the other way up. 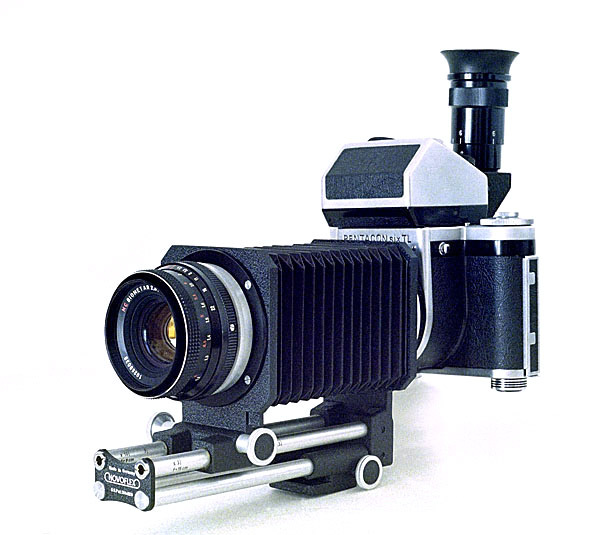 As the TISBIG–U is mounted above the lens, it is not designed to be attached to a tripod, and so it lacks the second set of rails that is found on the standard TISBIG, which is there for the focussing slide that is mounted on a tripod, as there is of course no focussing slide on the TISBIG–U. More information on the TISBIG–U can be found here. 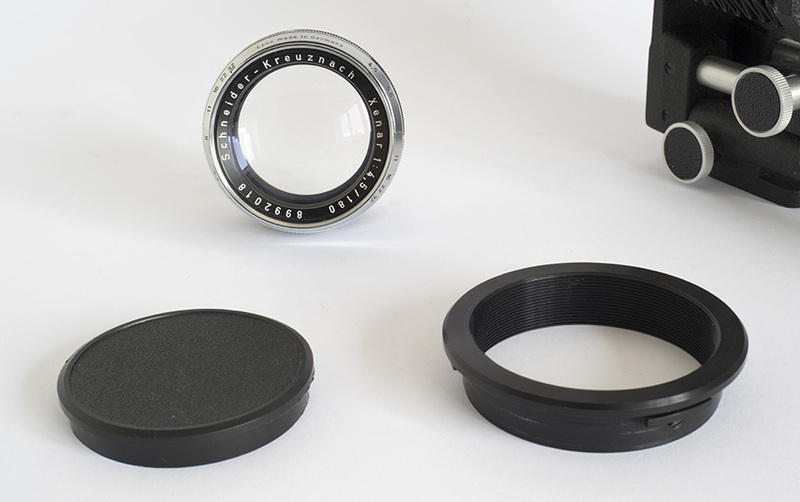 It would appear that these two Schneider Xenar lenses offered by Novoflex had been designed for larger-format cameras (larger than Medium Format). 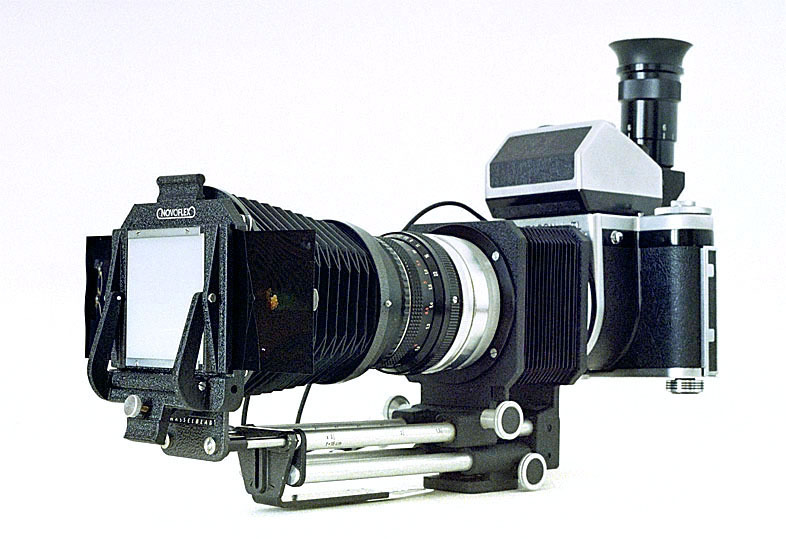 On such cameras, the “flange distance” or “register distance” from the lens to the film is much greater than in Medium Format cameras. 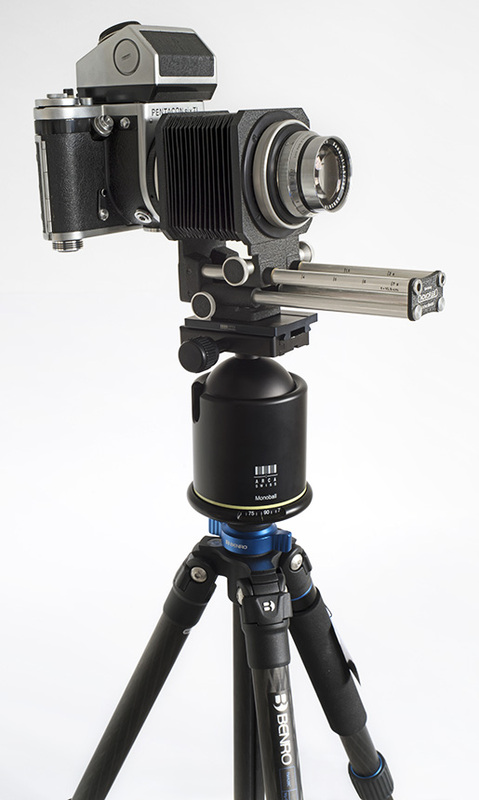 The Novoflex bellows at maximum extension, with 150mm Schneider Xenar, mounted on a Pentacon Six from one of the last years of production. The Novoflex bellows are better suited to the Xenar lens, with the minimum extension being very close to giving infinity focus, while the long maximum extension of approximately 195mm allows subjects approximately just 60mm wide to fill the frame, i.e., very nearly at a scale of 1:1, which means that the image recorded on the film is very nearly life-size and prints (or screen images) will reproduce the subject larger than life-size! Decades later, the Exakta 66 publicity claimed the same infinity focus for the Schneider Symmar 135mm and 180mm lenses that it was planning to mount on its newly-developed bellows. Unfortunately, the length of the minimum extension with their bellows (66mm) was too great, so this turned out to be impossible. For more information, see here. However, infinity focus with the two Symmar lenses for the Exakta 66 could be achieved with these lenses when using the Pentacon Six bellows. See here. 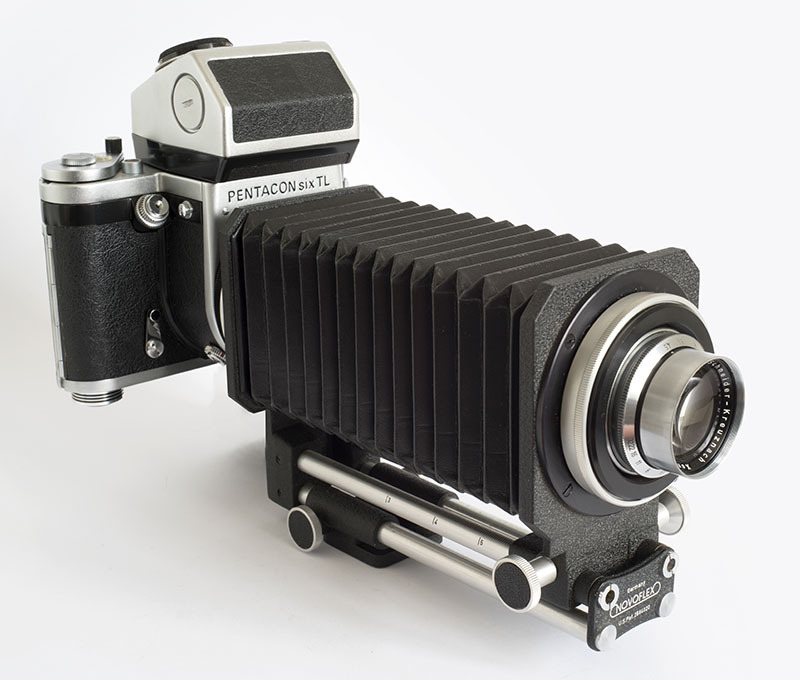 The Praktisix / Pentacon Six bellows had one advantage over the Novoflex bellows: they had a cable-release socket to enable the aperture pin on the Carl Zeiss lenses that were designed for the camera to be depressed, by means of a double cable release. See here. However, this is not a solution for hand-held photography. 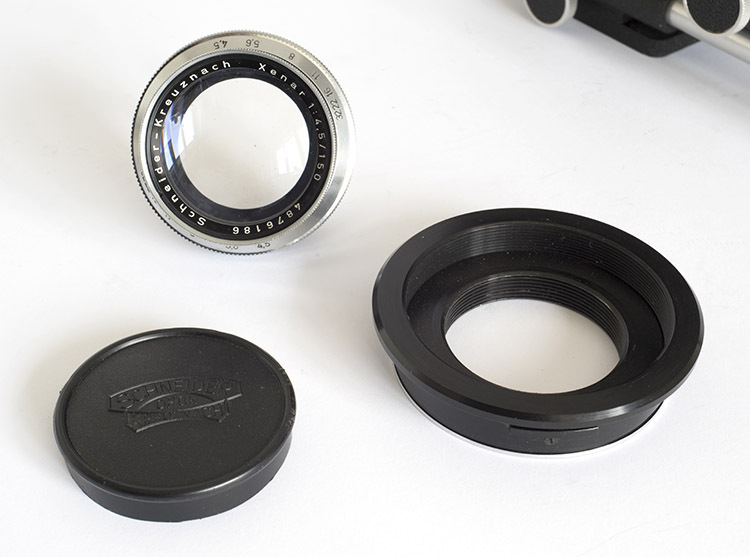 Aperture automation when using the Zeiss lenses could also be achieved with the Novoflex bellows by the addition of the Special Aperture Control Ring, along with a double cable release. See here. However, with these lenses, infinity focus is not possible on any bellows. There would also be no purpose to adding this ring to the bellows when using the Xenar, as it doesn’t have an aperture stop-down pin (and infinity focus would be lost, too). 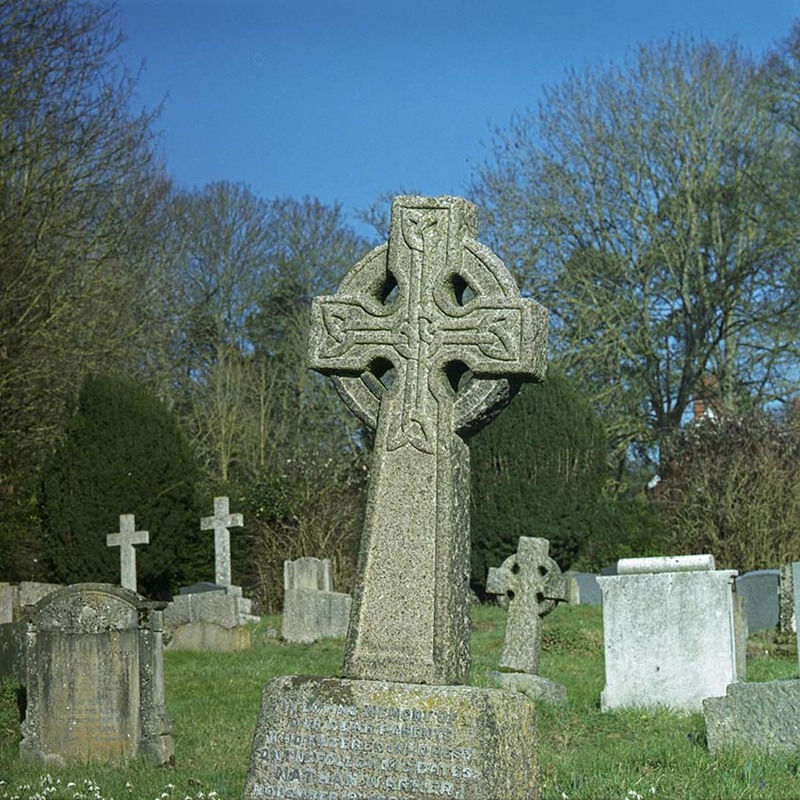 In February 2019 I returned to the churchyard of St Peter’s Church, Benington, which I had visited two years earlier to test the Makro Kilar / Macro Zoomatar lens. (See results here.) 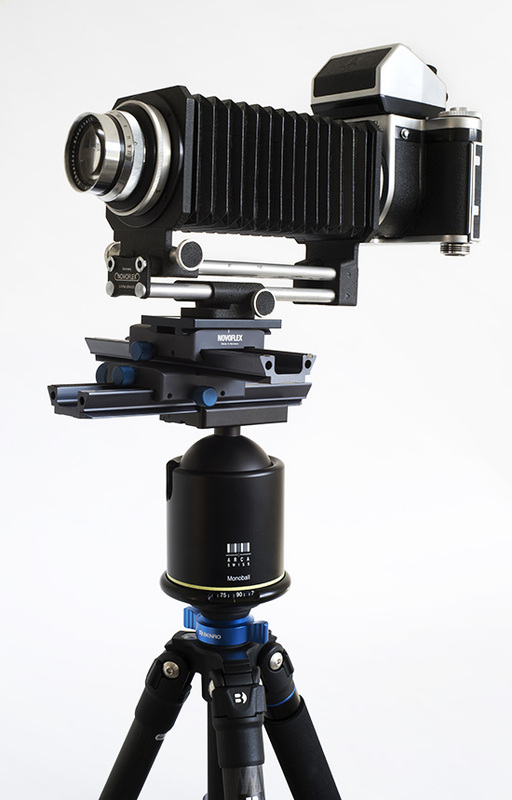 This time I took the above 150mm Schneider Xenar on these Novoflex bellows, mounted on my usual Pentacon Six. 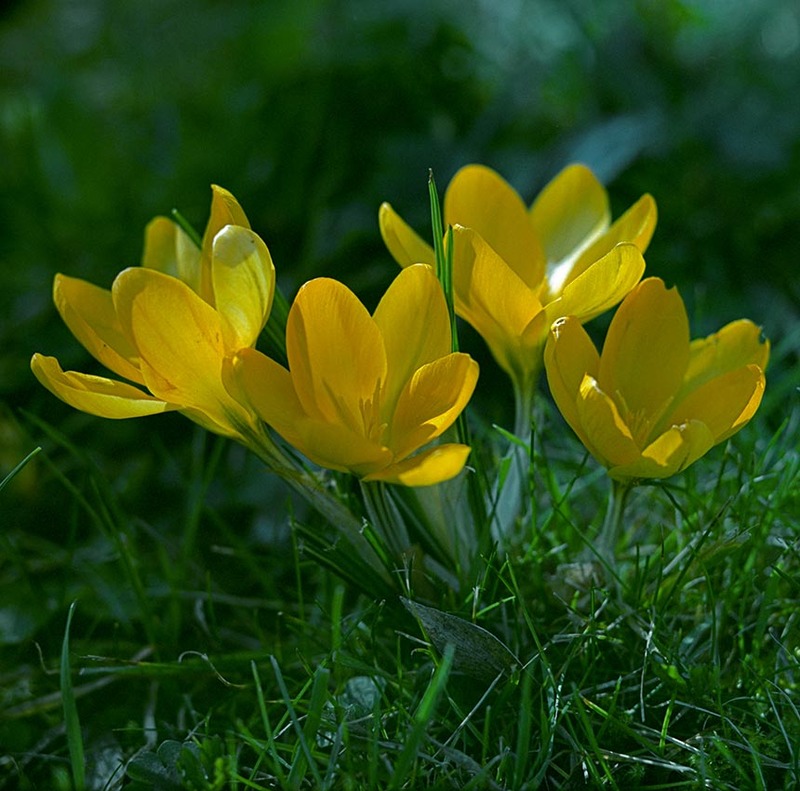 For February, it was exceptionally calm, warm and sunny. Film used was Fuji PRO400H. For the macro shots, I knelt on the ground (on a piece of plastic sheeting that I had brought with me! ), and I put the angle finder on the metering prism, so that I could have the camera as low as possible and yet view the image from above. 1/250 sec f/11 Mini-tripod. The tripod was not up to holding this outfit steady, or I would have increased the depth of field by choosing a smaller aperture, and in consequence of that, a slower shutter speed. The tripod was actually making it harder to hold the outfit steady, so all the rest of the shots were taken hand-held, at 1/250 sec. Metering was, as usual, with the Pentacon Six metering pentaprism on stop-down mode, and exposures were spot-on, except when I knowingly under-exposed by up to one stop, needing to use 1/250 sec because of the unreliability of the tripod and relying on the latitude of the film to record the shadow details. This is not the way to get the best results. The mini-tripod, bought when I was a student many years ago, went into the bin the next day. It was not worth even giving away. Now the search is on for a fairly small tripod that will hold a Pentacon Six rock-steady for macro shots, nearly at ground level and with the camera the right way up. We reported above that with the 150mm Xenar on the Novoflex bellows, it is also possible to obtain infinity focus, so here are a couple of shots focussed at or near infinity, taken on the same occasion. Here it was eight minutes past one on 27th February. 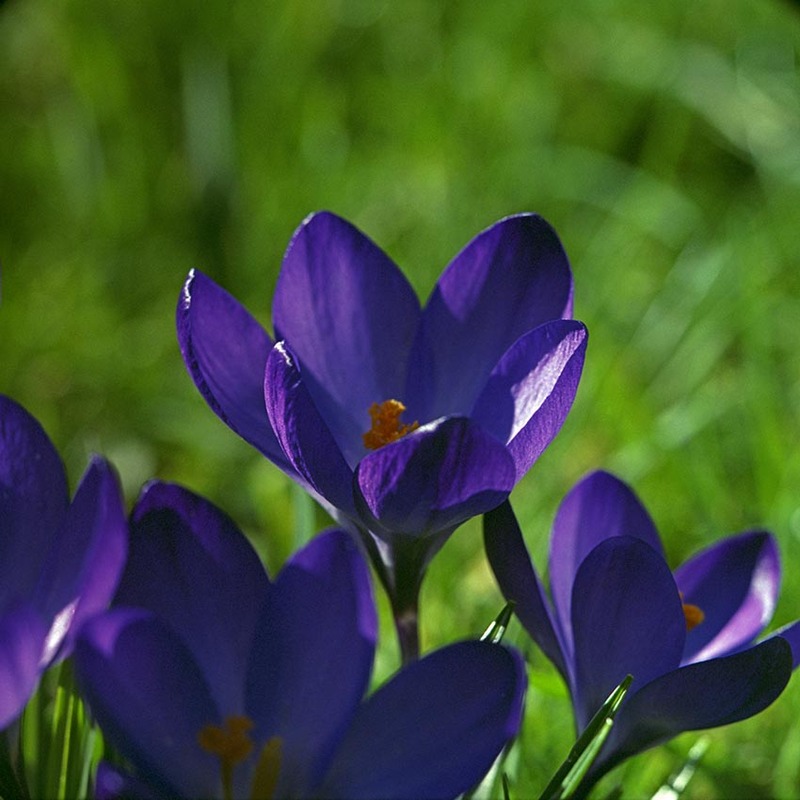 The Macro Zoomatar shot (here) was taken at about seven minutes to eleven on 9th March, two years earlier. The lighting for this tower is clearly better in the morning than in the afternoon, which must be borne in mind when comparing the two shots. Here we see that even when the lens is focussed at a distance of three or four metres and stopped down to f/22, the depth of field is still quite shallow, as would indeed be the case with any 150mm lens. However, this picture again shows even illumination right into the corners with the 150mm Xenar (which is to be expected, as this lens was designed for formats larger than 6×6). 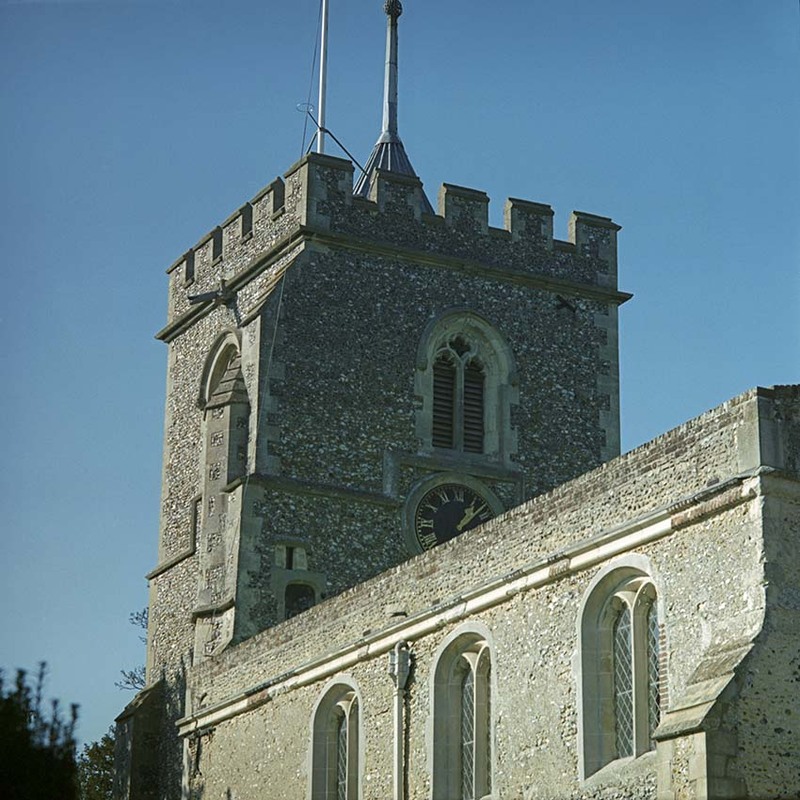 This 150mm Xenar lens must be at least 60 years old, but it still delivers superb results. Multi-coating had not been invented, but the single coating on this lens does an excellent job. I have not needed to increase contrast with any of these shots, but on the contrary, to reduce contrast slightly with some of them. Definitely a lens worth using with confidence! this reduces the risk of startling live subjects or frightening them away. However, photographers who are accustomed to using longer lenses in order to bring the subject closer may be surprised that when they mount a lens on bellows for macro photography, the longer the lens, the less that it magnifies the subject. 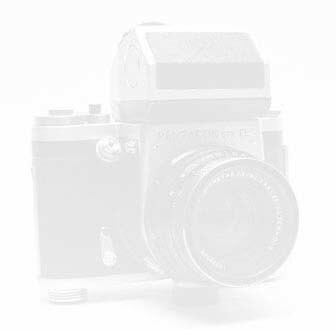 This is for a simple optical reason: to shoot a subject life-size onto film or a digital sensor with a regular 50mm camera lens, it must be extended by 50mm, part of which will be achieved by the focussing operation of the lens itself. To achieve life-size reproduction with a 100mm lens, it must be extended by 100mm, and so on. Thus, with a given bellows extension, the longer the focal length of the lens, the longer the extension that will be required to achieve 1:1 reproduction onto the film or the sensor. Once the maximum extension of the bellows has been reached, the longer the focal length of the lens, the less will be the degree of magnification. With this in mind, we will now look at the 180mm Xenar. The Novoflex code for this lens was “XUR”, as can be seen on the above catalogue page. This lens is much bigger and heavier than the 150mm Xenar, which has a 39mm Leica thread mount. 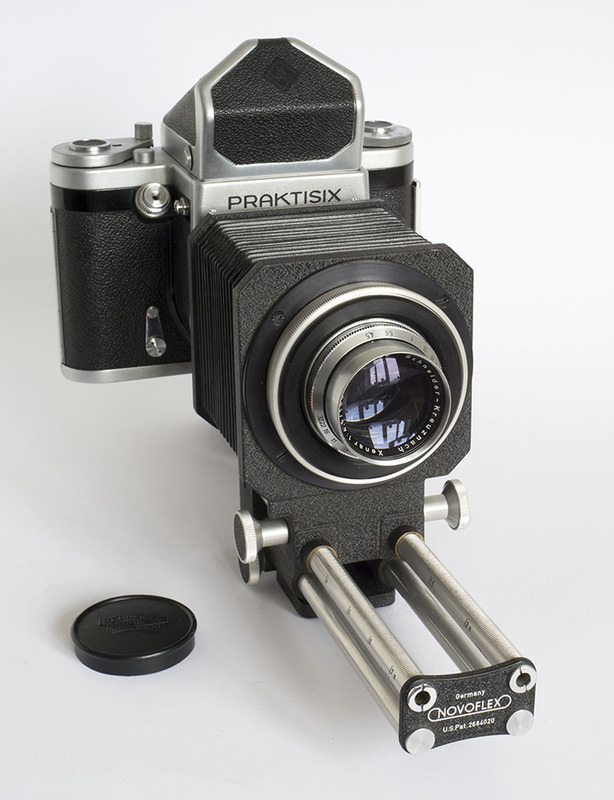 The 150mm Xenar requires the Novoflex “TISLEI” mount converter to Praktisix / Pentacon Six, as shown above. The 180mm Xenar has a mount that I measure as 56mm, and so it clearly cannot use the “TISLEI” mount adapter. The Novoflex adapter ring for the 180mm Xenar (code “XUR”) has the code “TISXURRING”. It can here be seen mounted on the lens. The next two images enable us to see the 180mm Xenar and the TISXURRING adapter ring more clearly. 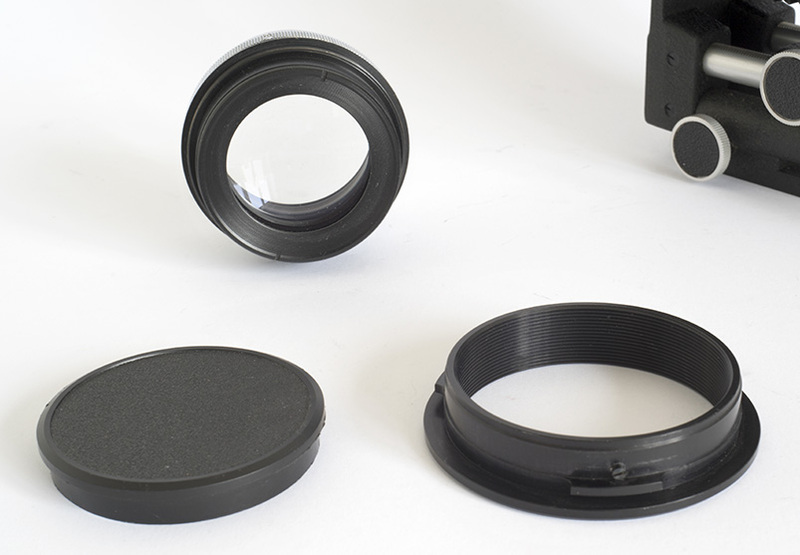 Here we see the front of the 180mm Xenar lens and the front of the TISXURRING adapter into which the lens screws. It is not necessary for this adapter ring to recess the back of the lens significantly below the front of the ring. And here we see the back of the 180mm Xenar lens and the back of the TISXURRING adapter into which it screws. In both of these pictures we can clearly see that the back of this ring has a standard Praktisix/Pentacon Six lens bayonet. 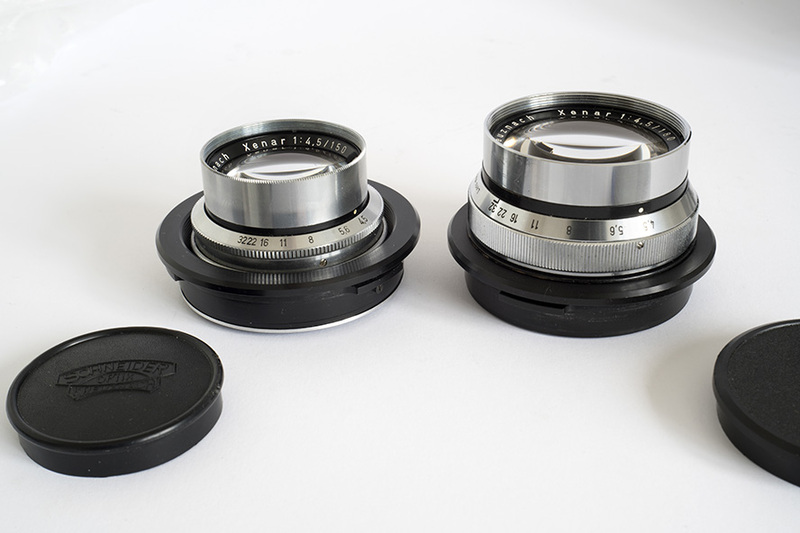 This side-by-side shot of the two Xenar lenses enables us to compare them and their Pentacon Six mounts. As must be the case, especially in order to achieve the same maximum aperture of f/4.5, the 180mm Xenar is significantly bigger than the 150mm version of the lens. In contrast, the TISXURRING for the 180mm Xenar is slimmer than the TISLEI ring that is used for the 150mm Xenar. 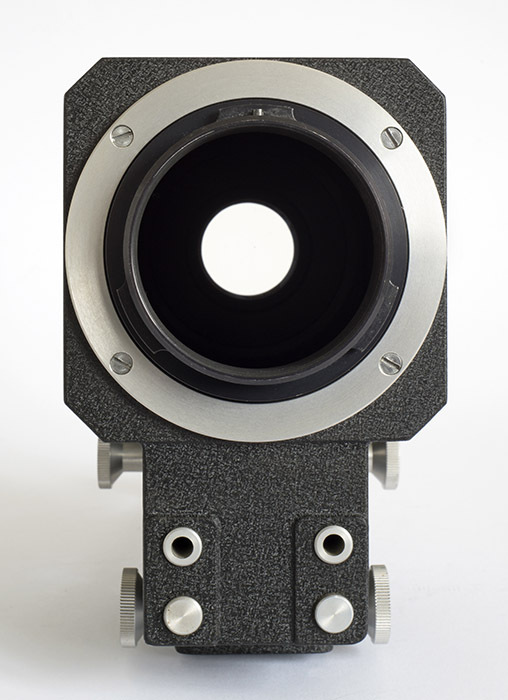 When the Novoflex bellows that are shown on this page are fully extended, the point of focus with the 180mm Xenar is approximately 470mm from the front of the lens, which is approximately 778mm from the film plane in the Pentacon Six or Praktisix. At this distance, the subject area that is visible on the focussing screen of the camera is approximately 80mm wide. A little more than this will be recorded on the film, but with standard masking in an enlarger or a slide mount, this will be very close to what is actually seen by the viewer of the resultant image. 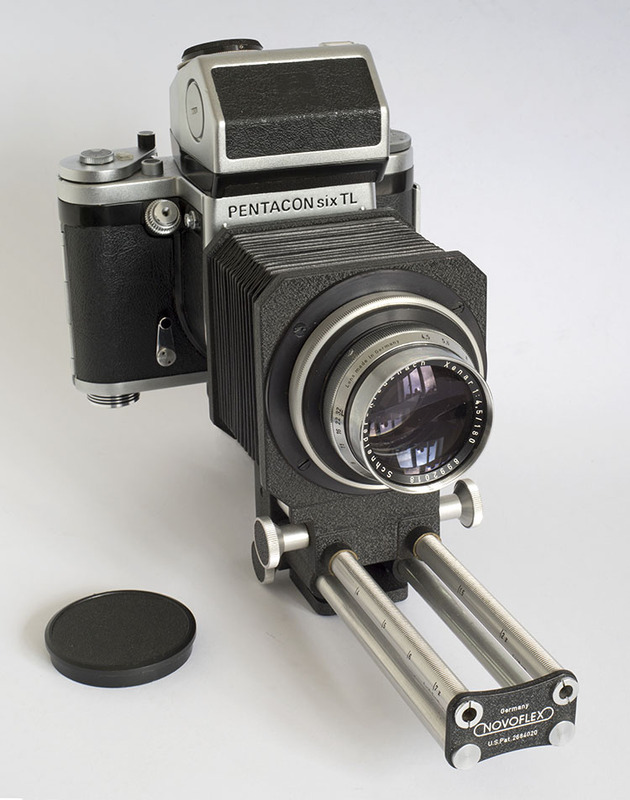 Finally, we show some more pictures of the 180mm Xenar mounted on a Pentacon Six and ready for use. Here the outfit is mounted on the Arca-Swiss B1-G monoball head, which is described in more detail here. For more information on the focussing slides (which are part of the current Novoflex range! ), see the image and text on the far right here. The bellows are here set at infinity focus for the 180mm Xenar. With the lens at infinity focus, we do not need the precise degree of lateral and front-back adjustment that is provided by the Castel-Cross, so here we have removed it. In this image we can see a little more of the Benro Mach3 TMA28C Carbon Fibre tripod, which is superbly able to hold this outfit rock-steady (unlike the tripod that we took with us for the test shots with the 150mm Xenar that can be seen above!). Here the bellows are at maximum extension. Even though the Novoflex bellows have their own focussing slide, here we have added the Novoflex Castel-Cross focussing slides, which as well as increasing the range of movement backwards and forwards, in order to obtain perfect focus, also enable precise movements to the left and the right, in order to obtain the best-possible composition without having to move the tripod. Such a set-up is highly recommended for macro work. We hope to be able to shoot some pictures with this lens soon. For information on tripods suitable for low-level photography, see here.